Pew: Middle Class Poorer, Earning Less And Shrinking : The Two-Way The report also finds that it is losing ground to the upper class when measuring aggregate income. The researchers at Pew Social & Demographic Trends aren't holding back in their new report on the middle class. It calls the last 11 years, "the lost decade" for the country's middle class. The highlight from the report issued today is that the middle class is poorer, earning less and shrinking. "These stark assessments are based on findings from a new nationally representative Pew Research Center survey that includes 1,287 adults who describe themselves as middle class, supplemented by the Center's analysis of data from the U.S. Census Bureau and Federal Reserve Board of Governors. "Fully 85% of self-described middle-class adults say it is more difficult now than it was a decade ago for middle-class people to maintain their standard of living. Of those who feel this way, 62% say "a lot" of the blame lies with Congress, while 54% say the same about banks and financial institutions, 47% about large corporations, 44% about the Bush administration, 39% about foreign competition and 34% about the Obama administration. Just 8% blame the middle class itself a lot." Most of what you need to know is in the graphs to the left. They show that the median household income for example, dropped from $72,956 in 2000 to $69,487. Perhaps the most dramatic figure is that median net worth took a major hit during the recession. It plummeted from $152,950 to $93,150. Another interesting graph shows that in past decades, the middle class continues to lose ground to upper incomes when you aggregate household income. For example in 1970, the middle class held 62 percent of the income in the country. The upper income held 29 percent. Those numbers have now flipped: The middle class is at 45 percent and the upper income class is at 46 percent. 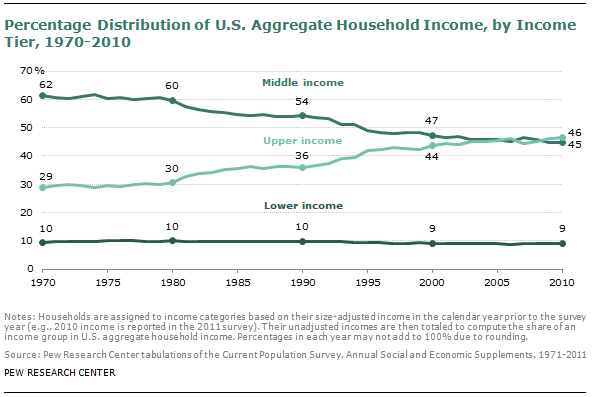 It's important to note that Pew considers three-person household making $39,418 to $118,255 middle class. When asked, most said it took at least $70,000 to be middle class.